The Russian-American crew trio enjoyed a flawless homecoming, setting sail from the Space Station at 7:57 UTC for a free flight of one and a half laps around the planet ahead of a rocket-powered braking maneuver and a blazing re-entry into Earth’s atmosphere. 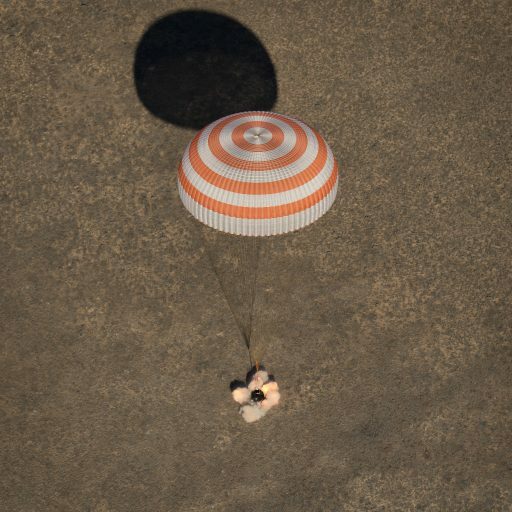 After emerging from the raging plasma of re-entry, Soyuz deployed its large orange-and-white parachute and descended through crystal clear skies over the remote landing area where recovery teams were awaiting the crew’s arrival. Soyuz fired solid-fueled rocket’s to cushion its contact with Terry Firma, coming to rest on its side at 11:21 UTC to cap the 131st flight of a Soyuz spacecraft since 1967 and close out the 50th Expedition to the International Space Station. Ground teams rushed to the landed Soyuz capsule in helicopters and all-terrain vehicles to pull the three crew members from the cramped quarters inside the small Entry Module. 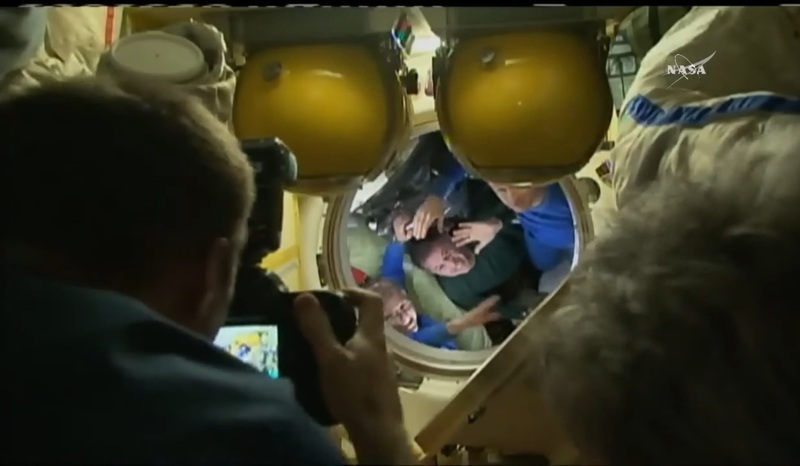 Placed in reclining chairs to get a breath to fresh springtime air, all three crew members appeared in good physical condition with smiles all around after a picture-perfect return from a memorable mission. Two veteran space fliers and a rookie commander, the crew of Soyuz MS-02 blasted off from the Baikonur Cosmodrome on October 19, 2016 on a two-day journey to their orbital destination. A four-week launch delay due to a wiring problem left the crew only nine days of overlap with the ISS Expedition 49 crew, creating an intense period of activity as the resident crew had to hand over hardware and experiments to the new arrivals, in addition to welcoming the Cygnus OA-5 cargo spacecraft. The Soyuz MS-01 spacecraft with an international crew trio from the U.S., Russia and Japan parachuted to a safe landing on October 30 and Ryzhikov, Borisenko and Expedition 50 commander Kimbrough had the station to themselves until November 19 when Oleg Novitskiy, Thomas Pesquet and Peggy Whitson arrived at ISS to complete the Expedition 50 crew. Setting out on a busy Station Increment, the crew was looking at over 200 scientific studies across all disciplines as part of the Station’s full utilization phase with dozens of experiments active at any given time in the various laboratory modules of ISS, taking advantage of the unique environment of Low Earth Orbit. 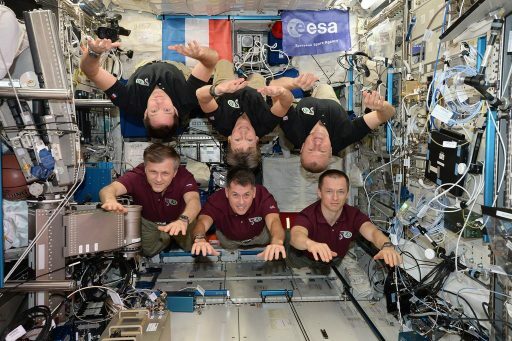 Acting as test subjects for many experiments, the crew members regularly participated in sample collection and different medical observations as well as tests of their vision and cognitive abilities. ISS welcomed the Japanese HTV-6 cargo craft in December which, among a wealth of supplies, also delivered the first batch of new batteries to upgrade the Station’s power system and ready the complex for its last decade of operations. 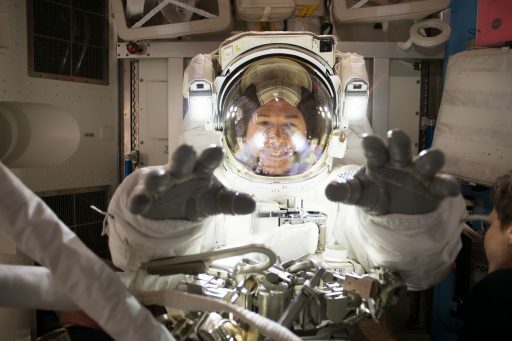 The new Li-Ion batteries replaced a dozen aging Ni-H battery units, requiring two weeks of robotic work plus two spacewalks by the three USOS crew members in January to finalize the installation of the new batteries. The tenth operational SpaceX Dragon arrived on February 23 followed by the Russian Progress MS-05 cargo vessel one day later, giving the crew plenty of cargo to be transferred. Dragon’s mission also delivered pair of external payloads transferred to ISS robotically to test out new technologies in space navigation and computing, and establish a state-of-the-art atmospheric monitoring station outside ISS, keeping tabs on ozone layer restoration and atmospheric pollution. The U.S. Segment crew again ventured outside for a pair of spacewalks in March and April to outfit the Station’s Pressurized Mating Adapter 3 that changed locations to prepare for its future role as a docking port for SpaceX and Boeing crew vehicles set for their first crewed missions in 2018. With a very successful mission winding down, outgoing commander Shane Kimbrough handed over command of ISS to Peggy Whitson who will lead Expedition 51 for the next eight weeks as the first female to hold the job of ISS commander twice. After Sunday’s Change of Command Ceremony, the joint Expedition 50 crew had a last meal as a six-person crew in orbit and caught a few hours of sleep prior to pressing into final departure preparations in the early hours on Monday. 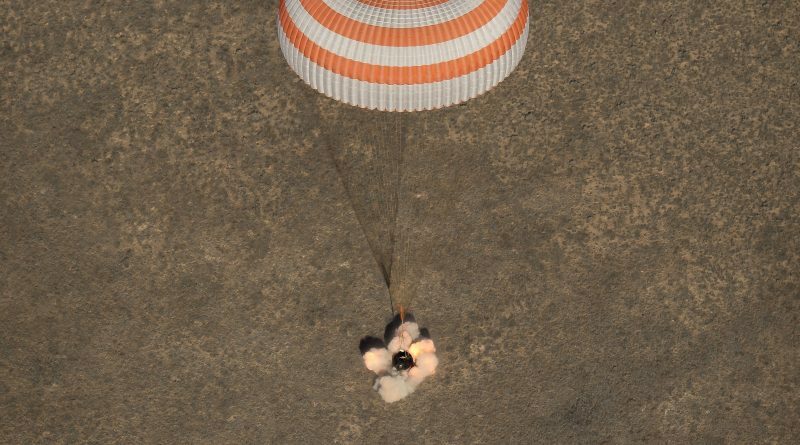 The Soyuz trio bid farewell to their friends and colleagues who are staying behind in orbit before floating into the confined space of their Soyuz spacecraft. Hatches swung closed at 4:45 UTC to mark the start of a three-hour preparation process that put the Soyuz through the prescribed leak checks, allowed the crew to put on their Launch and Entry Suits and buckle themselves into their seats to configure the Soyuz for free flight – running on autonomous power and switching to radio communications. First-time commander Sergei Ryzhikov strapped himself into the Center Seat inside the Entry Module to oversee the speedy return sequence. 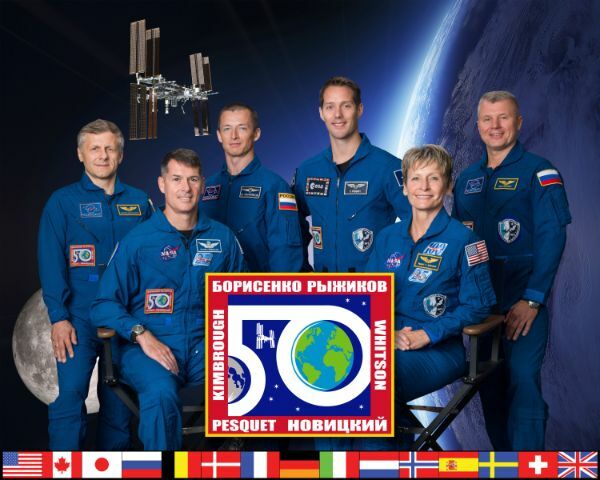 Andrei Borisenko, seated to the left of Ryzhikov, was gearing up for his second return from space after serving as a long-duration ISS crew member in 2011 for Expedition 27/28. In the right seat, Shane Kimbrough was looking forward to his first return aboard the Soyuz after flying on the Space Shuttle back in 2008 on an ISS assembly mission. The Soyuz docking mechanism powered up five minutes prior to separation and the Space Station entered a fine attitude hold, disabling thrusters for the mechanical uncoupling of the Soyuz commanded 90 seconds before departure to trigger the opening of the spacecraft hooks to break the structural connection with the Poisk module that had been in place for 171 days. 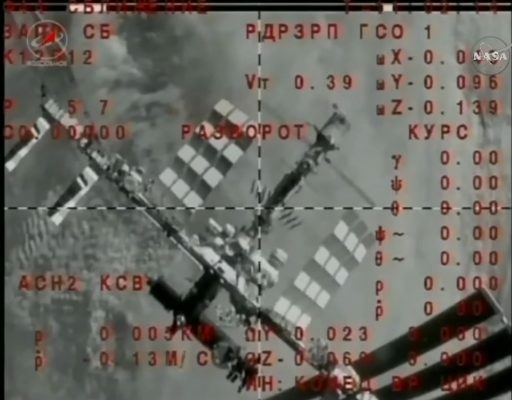 The seven-metric-ton spacecraft drifted away from the Space Station at precisely 7:57:30 UTC when loaded springs pushed the two spacecraft apart. Soyuz re-activated its thrusters three minutes after undocking, firing up on the first of two separation maneuvers to accelerate toward the direction of open space followed by a quick roll maneuver that lined the spacecraft up for a second and larger separation burn along the velocity vector. 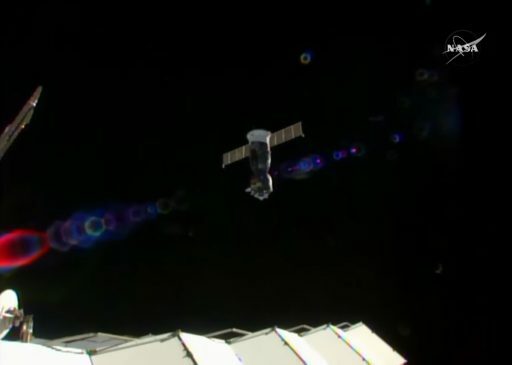 HD cameras on the exterior of the Space Station captured Soyuz and showed the noticeable acceleration delivered by the departure burn as Soyuz set sail to pull away from ISS over the course of a two-and-a-half-hour free flight designed to create a sufficient gap prior to the deorbit burn. Circling the Earth one and a half times, the crew was able to enjoy some last glimpses of the planet before concentrating on their crucial deorbit procedure. In preparation for its rocket-powered braking maneuver, Soyuz spun around to a tail-first orientation to face the ship’s main engine toward the direction of travel. Passing over the Pacific Ocean one last time, the crew verified the re-orientation, confirmed the protective over of the SKD engine had opened and propellant tanks were showing appropriate pressures for the critical maneuver. Ignition of the 300-Kilogram-force SKD engine was confirmed at 10:28:30 UTC while Soyuz was entering a south-west to north-east pass across the Atlantic Ocean, having just emerged from orbital night for the last time in its mission. The craft’s S5.80 main engine fired for four minutes and 38 seconds, slowing the Soyuz by 128 meters per second and transitioning it on a sub-orbital arc intercepting the dense atmosphere in a precisely calculated position. Falling toward the atmosphere, Soyuz again accelerated to a speed of 7.6 Kilometers per second while, onboard the small Entry Module, the three crew members closed their helmets to be ready for the planned depressurization of the Orbital Module – a prerequisite to the separation of the three modules of the Soyuz. Continuing on a north-easterly path, Soyuz crossed over the African continent in a steep dive toward the discernible atmosphere. A series of bangs shook the Soyuz at 10:55:21 UTC when a series of pyrotechnics fired to split the spacecraft in three – sending the disposable Orbital and Service Modules into opposite directions to head toward destructive re-entry while the 2.2 by 2.17-meter Entry Module powered up its Hydrogen Peroxide thrusters to point to the correct direction for re-entry. Module Separation occurred over the Red Sea as Soyuz passed 140 Kilometers in altitude followed three minutes later by Soyuz crossing the 100-Kilometer line over northern Iraq and dipping into the dense layers of the atmosphere. For the first 89 seconds of re-entry, the capsule held a pre-programmed orientation with its heat shield facing the direction of travel. From the onset of re-entry at 10:58:11 UTC, it took Soyuz 23 minutes to slow down from 25 times the speed of sound to a complete halt. Immersed in bright plasma, Soyuz relied on its ablative heat shield designed to slowly burn away to create a gaseous boundary layer between the spacecraft structure and the extremely hot shockwave layer of compressed air in front of the spacecraft. The heat shield had to endure temperatures up to 1,600°C and the windows began glowing bright yellow while the three crew members were completely on their own due to a four-minute plasma blackout. As part of active entry guidance, Soyuz executed a series of banks to dissipate energy while also modifying lift on the spacecraft to control its downrange travel distance in order to reach the expected parachute opening location. Just as Soyuz emerged from the plasma, the vehicle reached the peak G-load phase of the re-entry, being rapidly slowed down in the lower atmospheric layers. 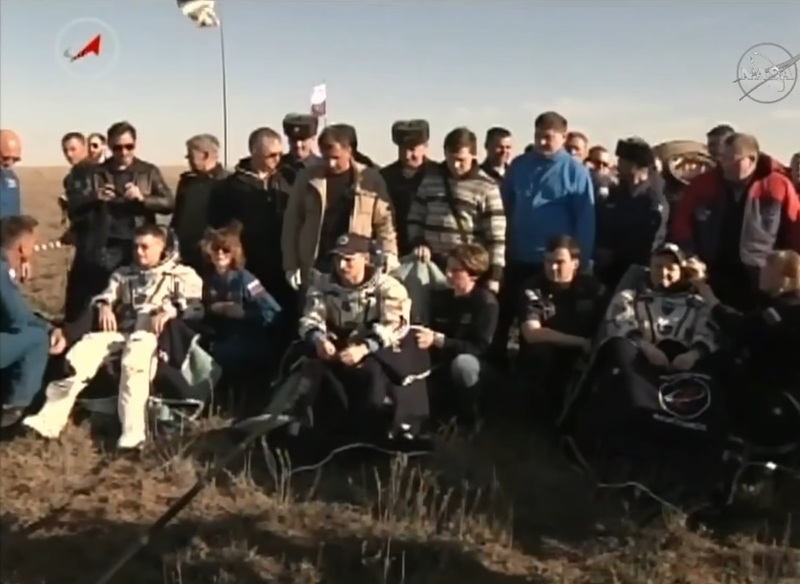 The crew pulled around 4.2 Gs when passing 34.0 Kilometers in altitude, traveling 2.15 Kilometers per second. 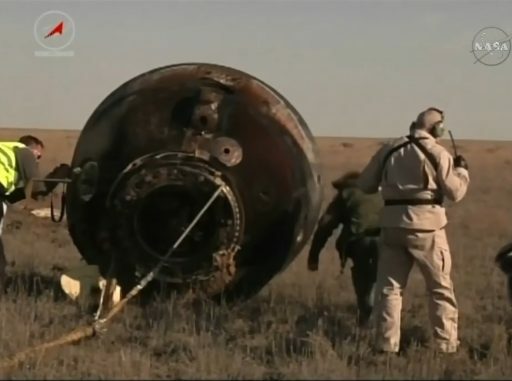 The crew’s arrival over the landing area was signaled by the familiar beeping of the Soyuz radio beacon before voice communications were restored and Ryzhikov confirmed all was in order after re-entry. At 10.8 Kilometers in altitude, Soyuz blew open its parachute compartment and ejected a pair of small Pilot Chutes that inflated and pulled out the larger Drogue Chute. Deployment of the drogue at a speed of Mach 0.7 created one of the wildest moments for the crew during the ride down with Soyuz gyrating rapidly for a period of around half a minute before stabilizing under the chute. Once slowed to 80 meters per second around 7.5 Kilometers in altitude, the drogue chute made way for the larger Main Chute to further slow the Soyuz down and transition the craft to a vertical descent toward the landing point. Crossing 6.5 Kilometers, Soyuz entered its automatic landing program, dropping the heat shield to expose the spacecraft’s gamma-ray altimeter and the landing engines to come into play in the final second of the descent. 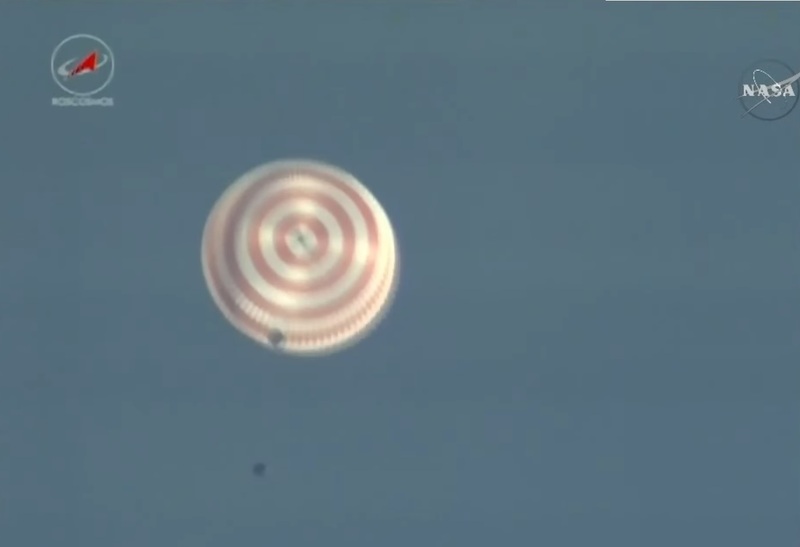 A cloud of water vapor formed around the Soyuz when the remaining Hydrogen Peroxide was vented from the tanks to avoid any hazards after landing. 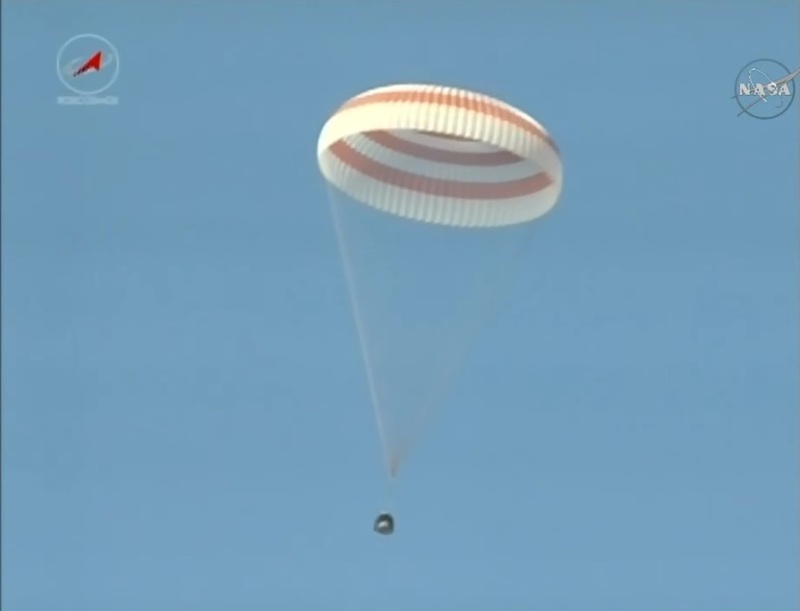 Rare views of the tank vent and Soyuz dropping its still-hot heat shield were provided by ground teams thanks to extremely clear skies and a very precise landing by the Soyuz craft. 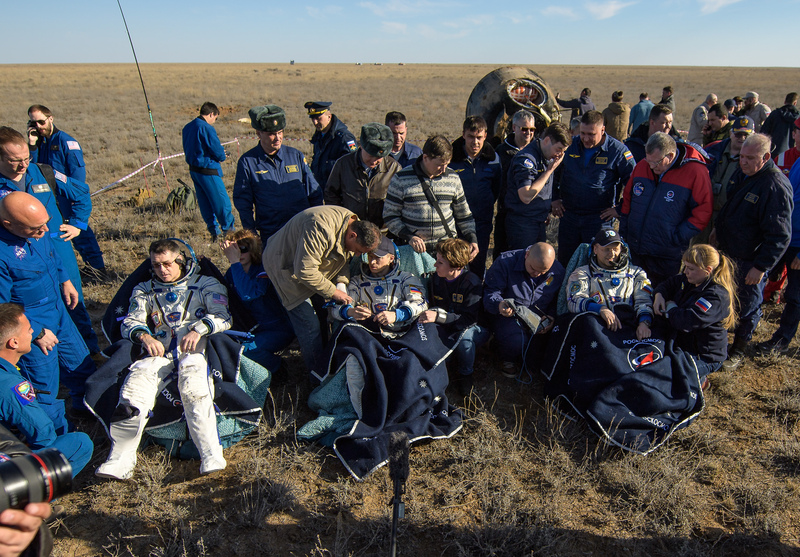 As Soyuz entered its final descent, the shock-absorbing seats moved the crew members up toward the instrument panel to fulfill their purpose upon contact with the ground. New for the Soyuz MS is the addition of a GPS receiver and Cospas-Sarsat transponder to allow the vehicle to be located in case of adverse weather or an off-target landing. 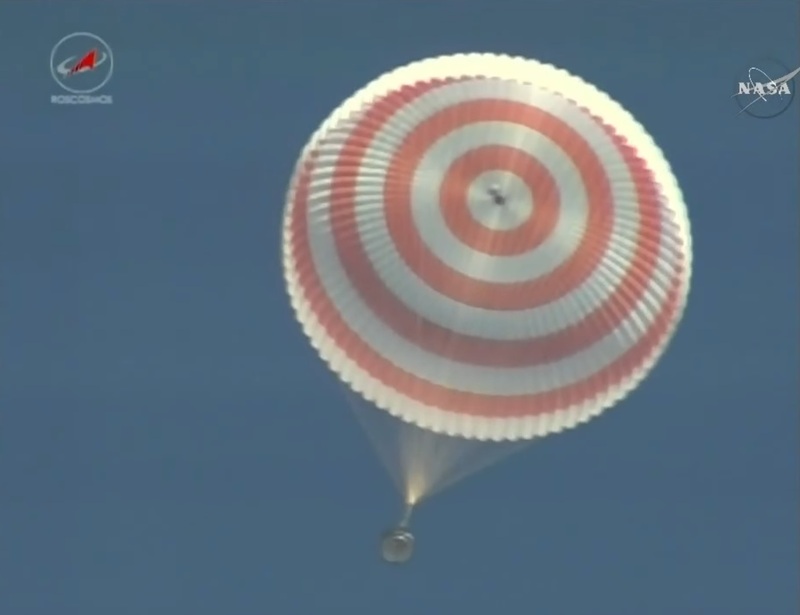 This was not the case on Monday and recovery teams were able to track the descending Soyuz in clear skies through the entire parachute phase of the landing. 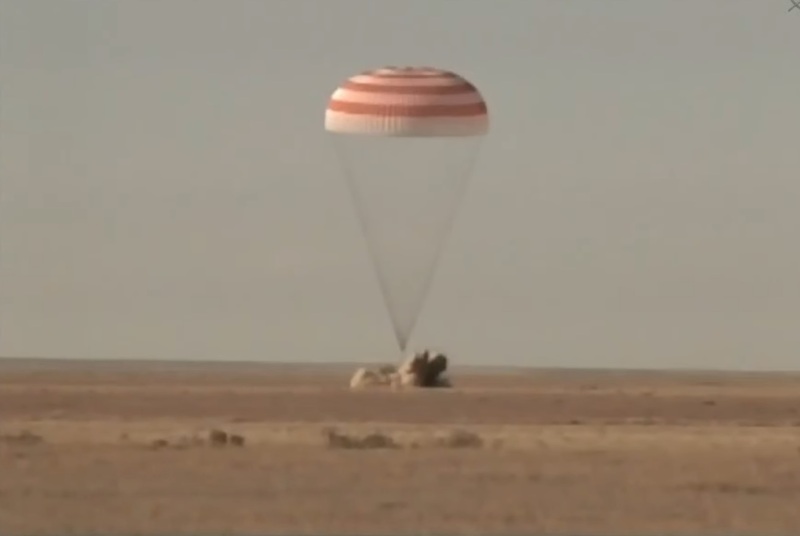 Soyuz used its gamma-ray altimeter to judge when touchdown was imminent to blast the solid-fueled Soft Landing Engines in order to cushion its impact. 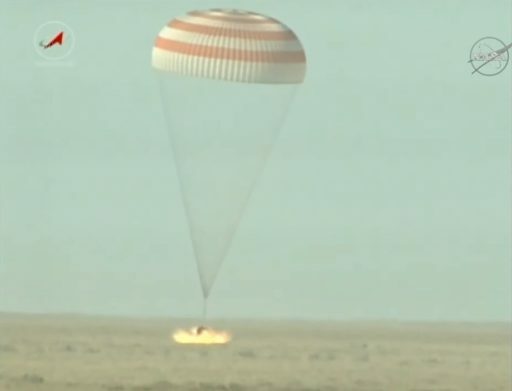 Landing occurred at 11:20:35 UTC, 5:20 p.m. local time in the Kazakh steppe to cap a flight of 173 days 3 hours, 16 minutes and 21 seconds. Recovery specialists were extremely quick in getting to the Soyuz and established voice communications with the crew before moving in to open the hatch of the spacecraft that had come to rest on its side after making a immediately after landing. All three crew members were extracted from the capsule in good physical condition, appearing in good spirits as they were sat in reclining chairs next to their spacecraft to enjoy fresh air for the first time in nearly half a year. Andrei Borisenko, with his prior trip to ISS as part of Expedition 27/28, now logged 337 days in space, ranking 41st on the all-time list. NASA Astronaut Shane Kimbrough spent 189 days off the planet on Space Shuttle Mission STS-126 and as part of Expedition 49/50, he performed six career spacewalks for a total duration of 39 hours (four during his long-duration mission to ISS). Soyuz commander Ryzhikov logged 173 days in space on his first mission. The three crew members will part ways after a welcoming ceremony in Karaganda, north east of the landing site – the two Cosmonauts will take a plane back to Moscow where they will undergo post-flight activities while Shane Kimbrough will have a longer trip, boarding a NASA plane to fly back to Houston. Preparations to replenish the Space Station crew are already in a final phase at the Baikonur Cosmodrome where veteran Soyuz Commander Fyodor Yurchikhin and Flight Engineer Jack Fischer are gearing up for the first two-person Soyuz launch since 2003. Set liftoff on April 20, Soyuz MS-04 will take the fast lane to ISS, arriving six hours after liftoff. ISS Expedition 51 will be in effect until early June when Soyuz MS-03 will return to Earth with Oleg Novitskiy and ESA Astronaut Thomas Pesquet, reducing the Station’s crew to three for nearly two months before the next crew launches aboard Soyuz MS-05 on July 28. 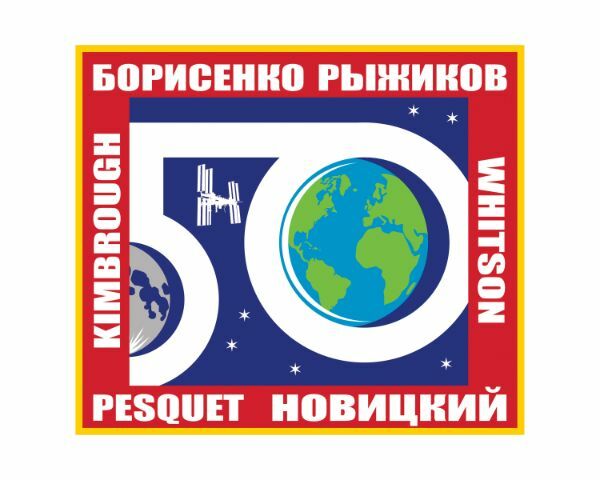 Peggy Whitson will switch rides once Soyuz MS-04 arrives on ISS, extending her stay until September to avoid reducing the ISS crew to only two members in the June/July time frame. The U.S. crew contingent will step up to four in late July as NASA takes advantage of vacant seats on a pair of Soyuz flights that are the result of Russia reducing its resident Station crew to two in order to save money and training resources.